Freehold Plot Area 240 sq. yd. (200 sq.mtr.) approx. Built-up Area 2072 sq.ft. (192 sq.mtr.) approx. Ground Floor Living Room, Dining Room, Bedroom with Toilet & Dress, Store, Kitchen, Front & Rear Lawns, Stilted Car Parking. First Floor A large Bedroom with Toilet & Dress, Family Room, Bedroom with Toilet & Dress, Puja Room, Balcony and Terrace facing the green area. Front & Rear Lawns shall be landscaped. 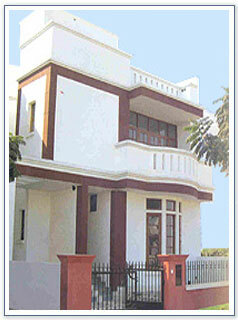 Located at Sushant Lok - III, Gurgaon and just a 15 minutes drive from IGI Airport, New Delhi.